I've probably said this before, but I always get a kick out of the availability of limited edition flavors. Case in point: my recent survey of Turkey Hill limited editions flavors. Sure, I can still pick up July's Chunky Peanut Butter which isn't that much of a stretch BUT along with the seasonal (August) Baked Apple Dumpling I could have also picked up April's Fried Ice Cream. Maybe Market Basket is just trying to mess with me this September. Whatever the deal, I decided Baked Apple Dumpling was the cinnamon ice cream I was more in the mood for. 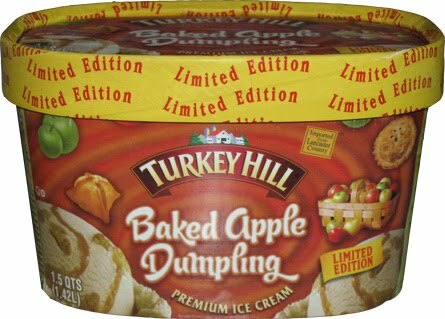 Turkey Hill Baked Apple Dumpling premium ice cream is Cinnamon Ice Cream with Caramel Apple Swirl and Apple Dumpling Pieces. It's basically the same general idea as Edy's (chewy) Apple Pie... but I digress. Oh man, look at all the "dumpling" pieces!! I love when a container is chock full of bits! Nothing gets me more psyched up to try a flavor than when I crack open a container to find this many bits inside. I like the base ice cream. Not chewy, but not to dense either (we are only at 66g per 1/2 cup serving). It's flavorful, but not potent, and not too artificially either. I will admit that it gets kind of hard to describe various ice cream fruit flavors, but overall, I like it alot more than I expected too. You can see the swirl a bit at the top of the picture above, and lightly throughout. It's got a decent flavor, nothing to sickenly sweet or artificial. If doesn't seem to be taking over the show here, and that's a good thing. This is apple dumpling, not apple swirl, so you will definitely understand the focus on the bits and not the swirl (which I think is the right call here). On Second Scoop: During my initial encounters with Baked Apple Dumpling, a thought came to mind. "if I was in the right mood one morning, I bet this would rock as a breakfast". Well, that mood struck me Thursday morning and so I scooped myself a modest bowl of B.A.D. and it did indeed taste great. I'm a huge fan of breakfast and I love things like jelly on toast, or a fruit danish, or even a fruity toaster strudel, so this just came as a natural progression of that love. 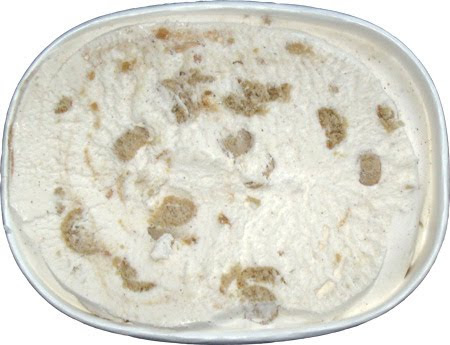 It's not so sweet as to be too bold in the morning and it's got that generous amount of dumpling bits to balance it out as a complete taste and texture rather than just a simple ice cream. No I probably wouldn't eat it every morning, but I totally enjoyed my breakfast that day. Wow.. what a unique ice cream! I wish they sold turkey hill in my area. I wish that turkey hill made more pints available. This looks good, but I'm not sure I'll want the entire container. Ice cream for breakfast? That's an interesting proposition, Dubba. We'll mention your experiment on our blog and see what our readers say about ice cream as a morning meal! @THT: hehehe, sweet, I'm curious to see how they will react! @Rodzilla: Pints are immensely tough for me to find in MA. Only Market Basket has them, and its always Moose Tracks. First time for me in this blog. I'm crazy over ice-cream.Dugg this blog. This is the top flavor for me, and their Woopie Pie Ice Cream is a solid second. Sounds crazy but this is awesome in coffee!